Safex Electromech is a leading manufacturer of material handling equipment. With world-class quality and reliability, its products are used in a variety of industrial applications throughout India and the world. The company offers a range of lifting solutions, including electric overhead travelling (EOT) cranes, jib cranes, gantry cranes, wire rope hoists, material elevators / cage hoists, chain pulley blocks (CPBs) and trolleys. Safex Electromech also offers custom-designed lifting solutions to meet the unique material handling requirements of the manufacturing, iron and steel, power, energy, automotive, petrochemical, food and pharmaceutical industries. Safex Electromech is an ISO 9001:2008 certified company, and also supplies CE marked products. It manufactures equipment suitable for Zone1, Zone 2, Gas Group IIA, IIB and IIC hazardous areas. With diverse applications and a wide range of customised products, Safex Electromech strives to provide solutions to all your material handling needs. In hazardous areas where flammable, explosive and corrosive vapours, liquids and gases are expected to be present, the most important demand to be met by material handling equipment is a high degree of reliability and precision, as faults may entail serious danger to plants and personnel. Through years of product development, testing and application, Safex Electromech has established high levels of expertise in flame-proof equipment. 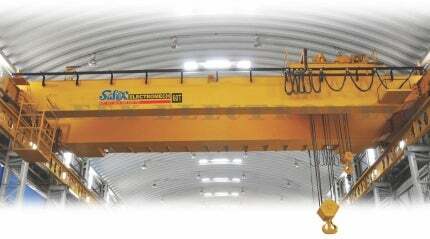 Safex Electromech KX hoists and cranes are specially designed for explosive areas. The equipment is made with electrical components housed in flame-proof enclosures confirming to IS/IEC-60079 and mechanical components designed with spark-proofing features. It is widely used in chemical and petrochemical industries where there is a presence of flammable gases and dust. Safex Electromech EOT cranes are available in several designs to suit different industry requirements. Its single-girder, double-girder, gantry, under-slung, jib and wall-travelling cranes are made in a wide range of capacities, spans and lifts to suit individual applications. The company offers both standard models and customised designs for EOT cranes and electric wire rope hoists. All equipment is manufactured to Indian standards, with rigid quality control and factory testing prior to shipment. Safex Electromech material elevators / goods lifts are suited to high working loads and continuous operation, and are widely used in the pharmaceutical, food and chemical industries in both safe and hazardous environments. The company’s standard and flame-proof material elevators are available in counter-weight or cage hoist design in customised sizes and capacities with advanced safety features built in. Safex Electromech aims to provide outstanding after-sales service and technical support for complete customer satisfaction. The company’s service engineers work with clients to determine a service and maintenance programme suited to fit individual equipment and plant needs. Along with installation and commissioning, Safex Electromech also provides gantry alignment, load testing and certification, complete overhauling, modernisation and refurbishment, spares and accessories, annual maintenance contracts, on-call breakdown service and structural design services. Its factory trained service personnel work to deliver quality results with minimum downtime. Safex Electromech offers a wide range of products to serve diverse industrial applications, along with excellent service support. The company strives to provide complete material handling solutions with safety, durability, operational reliability and value for money. Please contact Safex Electromech with your material handling requirement below.